If you need to find the area and perimeter of a rectangle, this calculator is the handy tool you will need. By simply inputting the length and width, this calculator will almost instantly find the perimeter (P) and the area (A). If interested in calculators for a variety of other shapes, you can look at more of our handy calculators. But you can stick around here and learn more about finding the area of a rectangle. A rectangle has four 90 degree angles. If the lengths of the sides are all the same, then the rectangle is also a square. The lengths of the sides will be given as a,b or you can use l and w for "length" and "width". The diagonal, which goes from one vertex to the opposite vertex cutting the rectangle into two squares, is called the diaganoal and noted as d.
Here are the basic formulas used by the calculator. Diagonal is d² = a² + b² which is the Pythagorean Theorem (see our Pythagorean Theorem calculator). Note that to solve for d, take the square root of both sides of the =. 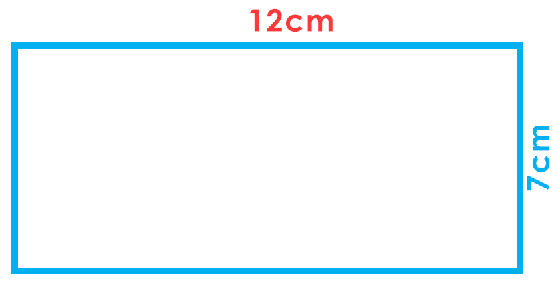 Example of calculating area of a rectangle. Using the same dimensions, we can calculate the perimeter. These examples illustrate how to calculate manually, but if you prefer to use the calculator for quicker results or to merely check your work, then feel free to do so. A great feature of the calculator is that you can find either the length of the width if you know the perimeter and the one of the two dimensions. What is the area, perimeter, and diagonal of a rectangle? How to calculate the area, perimeter, and diagonal of a rectangle? Imagine the Area of a rectangle as boxes inside a rectangle. The rectangle below has a covered area of 12 "square units"
The space inside a two-dimensional shape is the area or the amount of covered shape. A is the Area, L for the length, and W for the width. Calculate the Area of a rectangle that has a length of 7 centimeters and a width of 5 centimeters. A = 35. The given length(L) is 7 and 3 for the width(W). When multiplied, you will get 35 as your Area. Take a look at the image below, a person is walking around the box. The path he walks around from the starting point and back is the Perimeter. Knowing the length and width of a rectangle, we can now get the Perimeter of a rectangle. Both opposite sides of a rectangle are congruent which means adding those sides, we can calculate for the Perimeter. Find the perimeter of a rectangle that has a length of 12 centimeters and a width of 7 centimeters. The answer is P = 38. By adding 12(L) + 7(W) + 12(L) + 7(W), you will get 38. By multiplying the Length(L) and Width(W) by 2 then adding the quotients, you will get the same answer. If you look closely, a rectangle is a combination of two right angles. A Diagonal is the division of a rectangle to form two right triangles identical to one another. 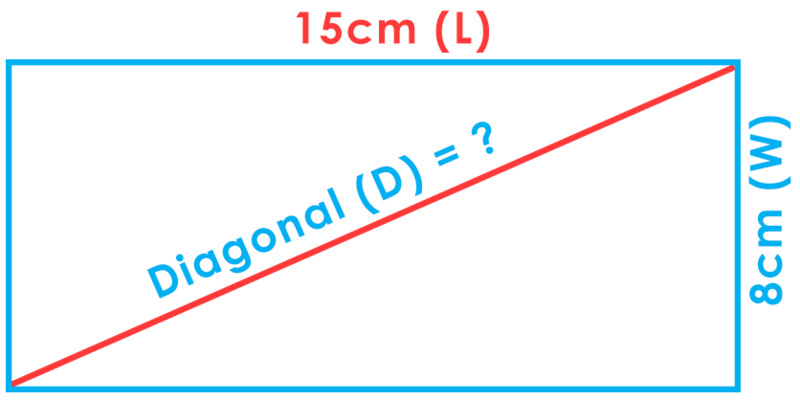 Solve for the rectangle's diagonal length whose sides are 15cm for the Length and 8cm for the width. The diagonal of the rectangle is 17. Square the values of Width(W) and Length(L), then get the sum of the two squares. Knowing the sum of the two squares, find the square root of the sum. Calculate for the diagonal length of a 3ft long and 4ft wide rectangle. A newly wed couple wants to install tiles to the floor of the master bedroom. The room has a length of 20ft and a width of 30ft. The tile they chose has a length of 24in and 36in for the width. Solve for the number of tiles needed to fill the master bedroom. 1. Solve for the area occupied by the master bedroom. 3. Choose a unit to be used. This example will use feet. This means that each tile has an area of 6ft² and it needs to cover the area of the room which is 600ft². So, 6 × 100 = 600. The number of tiles needed to fill the master bedroom is 600. A farmer wants to add a cage for his chickens. He wants to add a new set of fence near his house and a vacant space with the length of 30 meters and width of 16 meters. Find the perimeter of the vacant space. 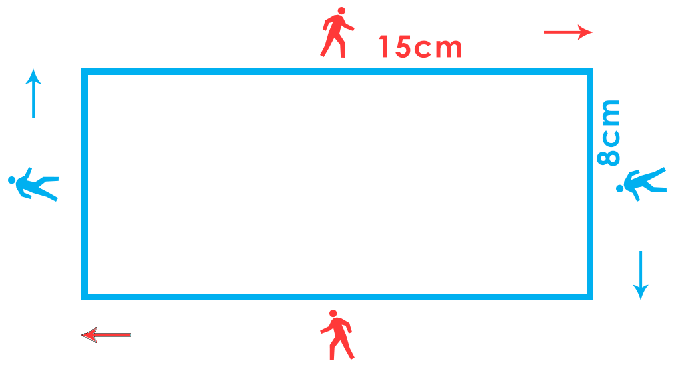 The Perimeter of the vacant space is 92 meters. A sandwich has a length of 12 inches and 8 inches for the width. 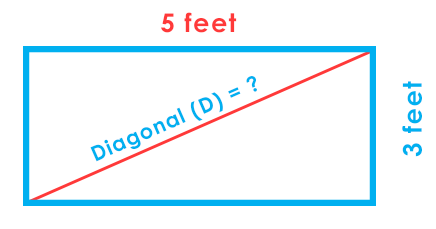 If you want to equally divide it into two right angles, what would be the length of the diagonal? The length of the diagonal to equally divide the sandwich into two equal right triangles is 14.42 inches.